Searches of the area after air strike revealed 7 bodies surrounded by vests, 5 Kalashnikovs and grenades. IDF Spokesperson Brigadier General Ronen Manelis on Thursday revealed additional details about the elimination of the terrorist squad in the Syrian Golan Heights. Manelis noted that last night, around 10:30 PM, the IDF identified a number of terrorists stealthily making their way in the southern Golan Heights. 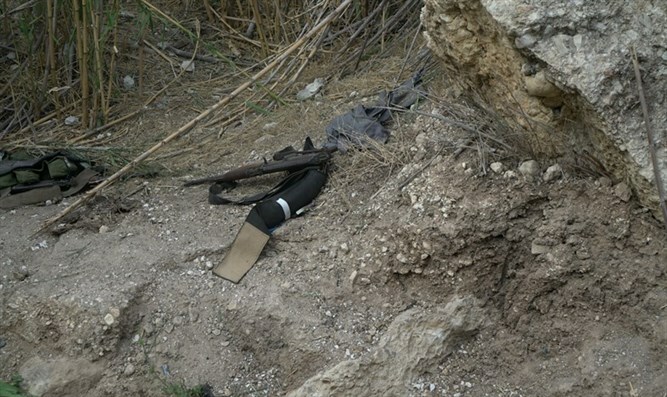 An Israeli Air Force aircraft attacked the squad, and this morning, during searches of the area, seven bodies were found, and around them were vests, five Kalashnikovs and grenades. According to Manelis, apparently all seven terrorists who were eliminated belonged to the ISIS terror organization. Defense Minister Liberman made it clear his morning that Israel views Assad's regime as responsible for all events on the Syrian side of the border. "As far as we're concerned, the situation is going back to what it was before the civil war - meaning there's a clear address, there's responsibility, and there's a central government," he said. "We did not involve ourselves and we do not involve ourselves in Syria's internal issues - as long as they keep to three guidelines which are central for us: 1) Keeping to every tiny detail of the Separation of Forces Agreement of 1974, 2) Syrian and must not act as Iran's forward base from which to fight Israel, 3) Syria cannot become a primary transfer point for smuggling weapons to Hezbollah in Lebanon. "The moment all three of these conditions are met, we have no reason to interfere or act in Syria. The moment they are not met, we will act according to the State of Israel's security interests."